Are wild animals reared by humans less fearful? So apparently, there’s an EU directive on its way that will (among other things) prevent us from using wild animals for experiments. The reason for this is that there is evidence that wild animals suffer more from the stress than do captive bred animals. I suppose this makes sense, as a hand reared bird, for instance or a laboratory mouse are much less afraid of humans than their wild counterparts, so all handling will certainly be less stressful for them (especially if you use low stress handling methods). However, the following article questions the difference in stress caused by other things than handling. Now this lot published a study (On PLoS ONE too) that showed that hand reared starlings show a milder stress response to human contact than their wild counter parts. The current study is an extension of that experiment to some extent. They wanted to find out whether this reduced stress response extended to other things. They used hand reared birds and wild caught birds and exposed them to a novel environment as well as a few different novel objects. They recorded the behaviour of the birds in response to exposure to these new things and analysed the time spent on various behaviours as well as time taken to do certain things. What they found was… well not a lot. 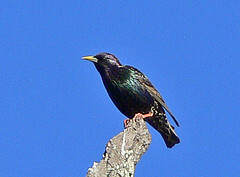 The hand reared starlings took more time to become active after being introduced into a novel environment however the novel object tests came out with ambiguous results. It would seem that either the behaviour was not easily interpreted or maybe just that hand rearing starlings doesn’t really have a very great effect on fearfulness of other things than humans. There is some evidence that hand rearing and environmental enrichment have an effect on behaviour, but in this study there was very little difference between wild and hand reared birds. Having said that, it is still better that the birds are less afraid of humans, so hand rearing is defensible in this way. I just wonder if maybe overcoming the difficulties in feeding (apparently getting the right diet for a young chick is really hard) might allow for captive breeding and selection for tamer birds. This would, however make it very difficult to infer things about the wild population other in the most general sense (domestic animals are used for experiments, so they have their utility). I also wonder how my stickleback work would go ahead if I weren’t allowed to catch sticklebacks. I guess I’d have to start breeding them, but even in a few generations there is a risk of creating great changes. For one, I’d only get fry from sticklebacks able and willing to breed in a fish tank, so selection cuts out some variation right there. Might mean better welfare, though. Sticklebacks are cowards and would benefit a whole deal from less stress. ← The Whale Sharks are Coming!